The holiday season is a time to enjoy with family and friends. Unfortunately, the season’s parties and special events also put food center stage. From easy-to-munch appetizers to rich, sugar-coated desserts, there’s plenty of temptation. Studies show that the average American gains 1 to 2 pounds by New Year’s, but a little planning can avoid that extra weight. All it takes is knowing your body’s needs, habits and weaknesses. 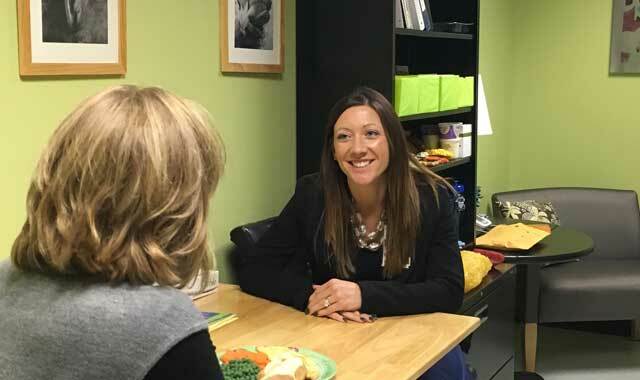 Tiffanie Young is a registered dietitian, licensed dietitian nutritionist, diabetes educator and program coordinator at Centegra Health System’s Diabetes Centers in Crystal Lake, Huntley and Woodstock. Young encourages smart eating habits that can lighten your holiday meals and still allow you to enjoy the season. When it comes to establishing healthy eating habits, there’s no single regimen to follow, says Young. Everyone has their weak spots, and acknowledging your own will help you avoid those future temptations. Having an attainable, specific objective will help you stay on track, but it should be tailored to your individual lifestyle and needs. “If you’re trying to lose weight on your own, setting a goal to maintain your weight throughout the holidays is more achievable and a better way to go,” says Young. Start by establishing rules for yourself before the parties begin. If you plan to sample appetizers, commit to only filling your plate one time, Young suggests. It will force you to be more mindful of what can often be mindless eating. Moderation should always be used over extreme tactics, too. Don’t skip a meal to save room for the party spread. But it can still be tempting to pick up that peppermint mocha during your holiday shopping or try the fattening turkey stuffing at a dinner party. Instead, pack some healthy snacks or bring a healthy dish to share. You can relax knowing you’ll have at least one healthy option at every outing. By knowing a few handy substitutes, you can cut some of the fat and sugar from your favorite dishes. Most recipes can be modified by replacing refined sugar, white flour, butter, eggs or oil with things like applesauce, bananas, flax meal or whole-wheat flour. These ingredients cut calories and add nutritional value. Look past your frustrations with food and remember that your loved ones are the reason for the celebration. This entry was posted on Wednesday, November 25th, 2015 at 11:59 am	and is filed under Health & Fitness. You can follow any responses to this entry through the RSS 2.0 feed. Both comments and pings are currently closed.